"The Miracle Worker" By William Gibson. This essay displays Annie Sullivan's positive influence on Helen, James, Kate, and Captain Keller from the book The Miracle Worker by William Gibson. The Miracle Worker is a story that shows the strength and power of human will and its ability to triumph over the most devastating handicaps. During the course of the story Annie Sullivan makes extensive changes in the lives of the members of the Keller family. Foremost, Annie's most tremendous impact is on the main character of the story, Helen Keller. 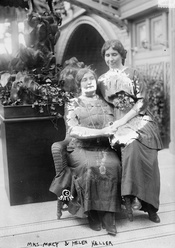 Annie not only teaches Helen to communicate with the environment around her, but at the same time she teaches her the proper etiquette of a human being without her disabilities. But that was not the case before she arrived at the Keller household. Before Annie had come to the Keller's, Helen was a child lost in her physical disabilities, and trapped inside a useless body, unable to communicate comprehensively with anyone or anything. English: Helen Keller. Français : Helen Keller. WriteWork contributors. ""The Miracle Worker" By William Gibson." WriteWork.com. WriteWork.com, 04 May, 2003. Web. 25 Apr. 2019. Conflicts within "The Miracle Worker"